MN Sn’Ice: Because in Minnesota, Snow & Ice are so nice! 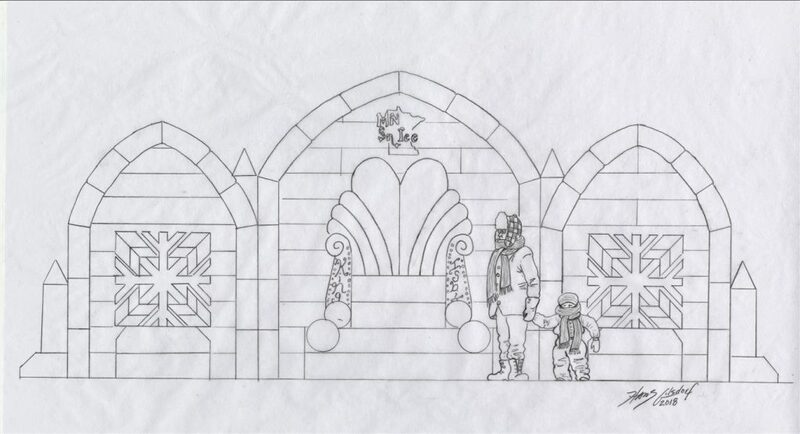 Plans for 2019 include King Isbit’s Royal Courtyard, Palatial Playground, an Ice Sculpture Competition and a Snow Sculpture Competition. Local artist, Hans Gilsdorf, has created a sketch of King Isbit’s Royal Throne – bigger, wider, and more intricately decorated for 2019. Lighting lessons were also learned, so expect the spectacular once the sun goes down! The Grand Lighting will take place on Thursday, February 7th at 7pm. The lighting will coincide with the kickoff to Detroit Lakes Polar Fest. Polar Fest begins February 7th and runs through February 18th, 2019. There are many activities taking place during Polar Fest, and we encourage you to check it out and learn more about Polar Fest! 7pm: Grand Lighting at King Isbit’s Royal Courtyard & Palatial Playground. Sledding Hill Opens: Limited sleds available, first come first serve. Bring your own sleds! Multi-Block Ice Carving Competition continues: Judging begins at 6pm. Awards immediately following. Visit King Isbit’s Royal Courtyard & Palatial Playground! Located on the corner of Washington Avenue and West Lake Drive, you won’t be able to miss it! Grand Lighting on Thursday, Feb 7th at 7pm. King Isbit’s Throne & the Royal Courtyard are located on the DL City Beach. The Sculptures Garden is located “next door” in the DL City Park. Professional Ice Sculptures will be on display beginning Feb 8th. An Ice Sculpting Competition is open to competitors, professional and non-professional alike. All competitors must be pre-registered. Local area high schools will create snow sculptures on Feb 13th. A friendly competition, the high school classes are encouraged to use their imaginations and all of the snow skills they have learned through a childhood of playing out in the snow! All Snow Sculpture Competition Teams must be pre-registered.